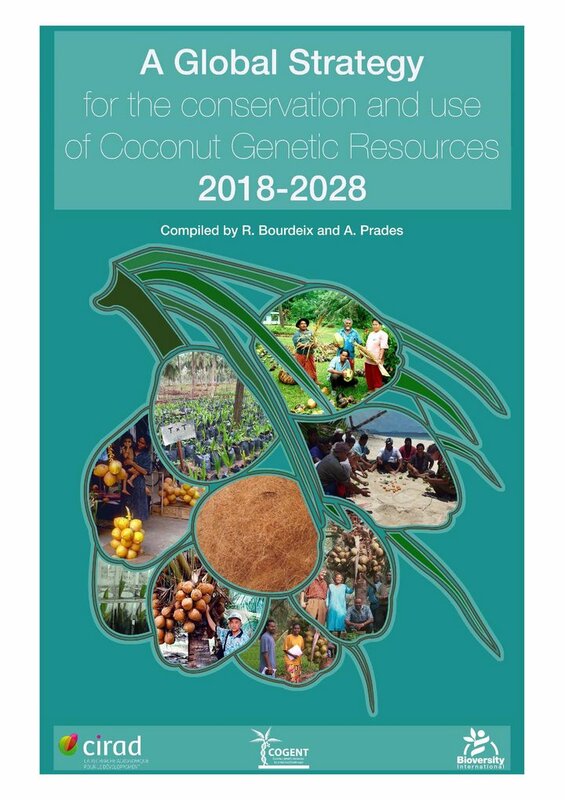 This Global Strategy for Conservation and Use of Coconut Genetic Resources has been compiled by Dr Roland Bourdeix and Dr Alexia Prades of CIRAD, (formal launch at the APCC 48th COCOTECH meeting in Bangkok 20-24 August 2018). An implementation plan will be discussed at a COGENT side-meeting 25-26 August. COGENT embraces 39 coconut-producing member-countries, representing more than 98% global production. COGENT aims to strengthen international collaboration in conservation and use of coconut genetic resources; promote improving coconut production, and boost linked livelihoods. This Strategy is the product of consulting with more than 90 key-experts receiving more than 400 contributions over seven years. It has been supported by Bioversity International, CIRAD, the CGIAR research program Forests, Trees and Agroforestry (FTA), and ACIAR/DFAT, and aims to support optimizing the conservation and use of as much representative diversity as possible. It is hoped that, as an evolving document, this Strategy will provide the benchmark for effectively implementing the comprehensive conservation and research agenda proposed by the international coconut research community, as a route to the enhanced wellbeing of the millions of coconut smallholders across the globe. Quoting Prof Gabrielle Persley (ACIAR Commissioner) in her Strategy foreword, “ coconut is indeed the “Tree of Life”. More than 100 million people living in fragile coastal areas … depend on coconut for their livelihoods. Coconut provides food and water, timber and leaves to build homes, and oil and copra for fuel and as a source of income. In times of environmental disasters, such as cyclones and tsunamis, coconut is often the last tree standing, able to protect and sustain communities in the immediate aftermath of the disaster, providing food, water and shelter while people rebuild their lives. Globally, the demand for coconut products is growing exponentially. The estimated global market for coconut water alone is predicted to be in the order of USD 10 billion by 2030. This growing export market for a wider range and higher value of coconut products offers new opportunities for increasing incomes for millions of small-scale coconut producers…. At a time when the demand for coconut and coconut products is growing worldwide, it is important to conserve and utilize the rich biological diversity of the crop. It is timely now for Bioversity/COGENT to be launching a new Global Strategy for Coconut Genetic Resources for the next ten years and beyond. It is also pleasing to learn that the Asia-Pacific Coconut Community (APCC) will be joining with Bioversity, the Pacific Community (SPC), the Global Crop Diversity Trust, ACIAR and the Australian Department of Foreign Affairs and Trade (DFAT) in support for this new strategy and its implementation through COGENT and its partners across the coconut producing world. A framework for promoting the effective conservation and use of coconut genetic resources developed in consultation with COGENT members and partners.